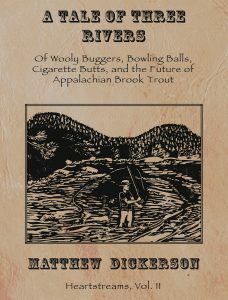 Matthew Dickerson‘s new book A Tale of Three Rivers: Of Wooly Buggers, Bowling Balls, Cigarette Butts, and the Future of Appalachian Brook Trout is now available. 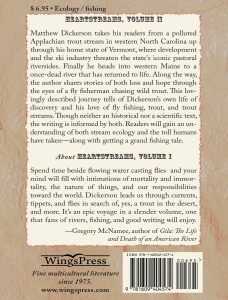 Continuing in his HeartStreams series (as a follow up to Trout in the Desert) this new extended essay of narrative non-fiction fly-fishing literature and nature-writing brings readers from streams in western North Carolina up through the author’s home state of Vermont and on to a river in Maine that was once one of the filthiest rivers in the United States and now is a blue ribbon trout stream. He tells of toes broken on bowling balls, cigarette-smoking trout, old washing machines, and also clear Appalachian streams, native fish, and signs of hope. As with the previous book in the series, this new volume continues original artwork–the prints of Vermont-based folk and wildlife artist and print-maker Courtney Allenson. The book is available direct from IPG (the publisher’s distributer), from an independent bookstore near you (like the Vermont Book Shop that handles special orders and autographed copies), or (if you must) from the big on-line box store.